The staff at Hotel Next2 were excellent- very responsive and helpful. The location is great- lots of great cafes, bars and shops nearby. It was also nice and quiet as the street it is on was closed to cars. The bed was excellent. Great location but because of this very noisy in the weekends. Great location 10 minutes walk to grand bazaar,also very close to shops,tram station. 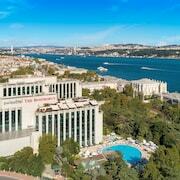 Look no further and take a look at our great range of rental properties in Istanbul!